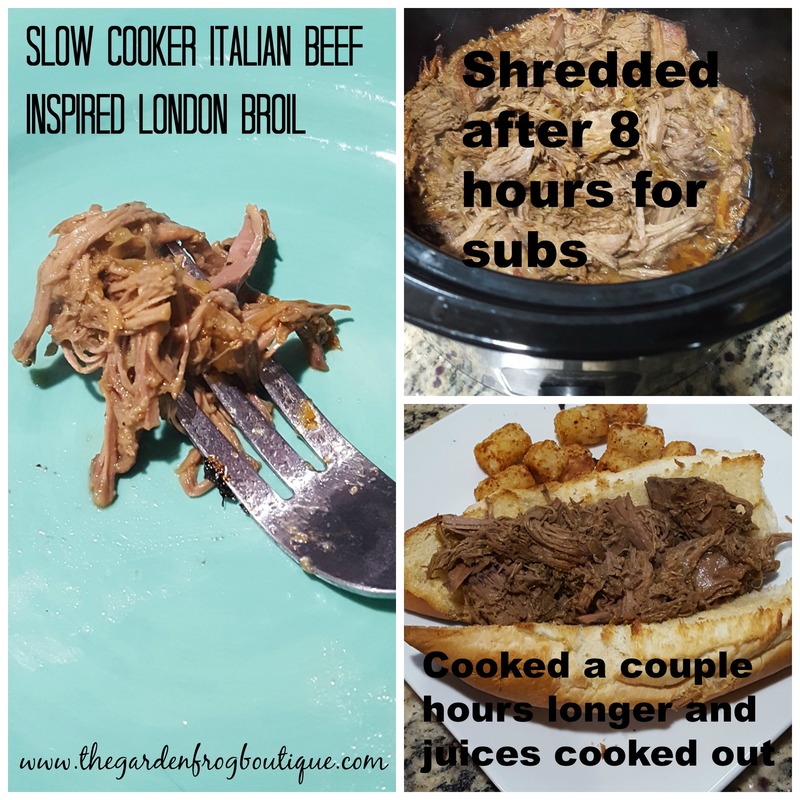 Slow cooker Italian Beef inspired London Broil recipe came from a subsitution from all those slow cooker recipes for Italian Beef. Last week when I made this recipe London Broil was on sale at my local grocery store for $2.88 a pound which was almost $3 a pound less than the chuck roast. 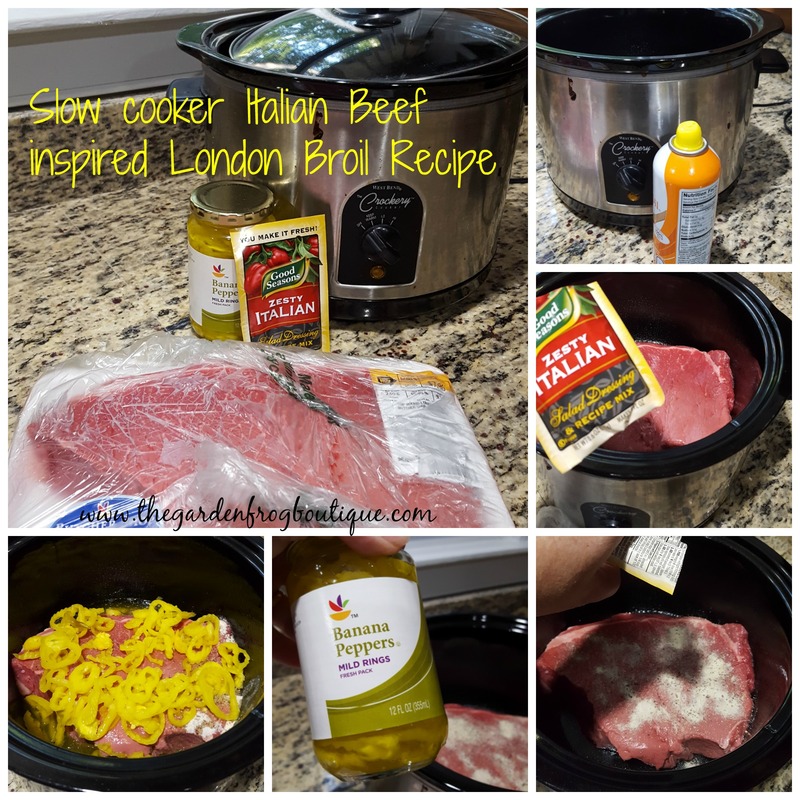 Spray your crockpot generously and then put the London Broil in. Sprinkle the packet of Italian Seasoning on top and pour the whole jar of pepper rings including the juice over the meat. Put the lid on, set the temp to low and let it cook all day. Check after 8 hours or so and tear the meat apart, shredding it for sandwiches, and put back in and stir all the juices, pepper rings, and the meat and put back on to cook (or serve depending upon the doneness of the meat). Plus the longer you cook the drier the meat will be. I do not each much red meat; however, I do like crockpot recipes for beef. I am a bit of a frugal shopper and when meat is less than $3 a pound I jump on it. Adapting a recipe to feed my family. You can shred the meat and make sandwiches or you could cut up and use as the main dish with other sides of your choice. This is a very flavorful recipe and I enjoyed eating leftovers (which is something I normally do not do). This recipe could be adapted to add onions, peppers, and maybe even mushrooms for more of sub inspired recipe. Crock pot recipes are easy to adapt and create to your family’s taste. This recipe will fill 6- 6″ subs or approximately 6 servings on the average. Thank you for stopping and checking out the recipe. 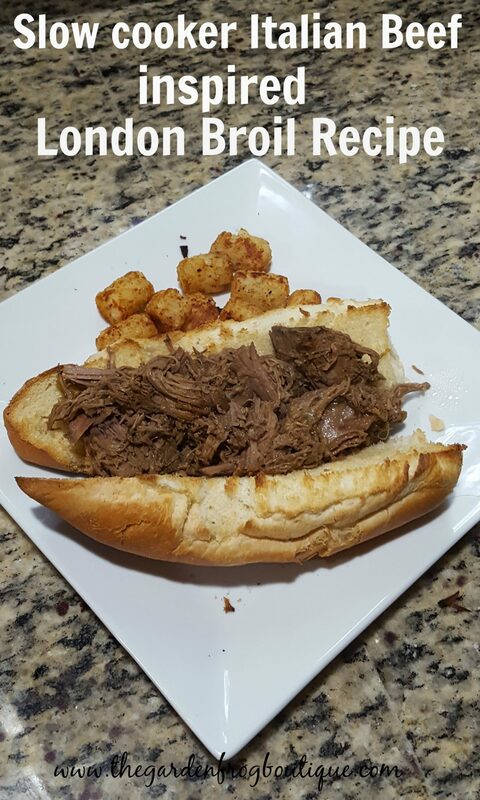 Looks absolutely delicious, Renee! Sharing it! Bren Pace recently posted…Don’t Fret About Resharing Your Old Posts! Automate It!